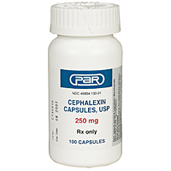 Shop for bladder health medications to fight urinary tract disease in dogs at VetDepot.com. The urinary tract consists of the kidneys, the bladder, the urethra, which is the tube that drains the bladder to the outside world, and the ureters that connect the kidneys to the bladder. Unfortunately, urinary tract disease is an all too common problem for both dogs and their owners. "The most common symptoms of kidney disease and failure are increased thirst and urination." Diseases that only affects the lower urinary tract usually do not produce more generalized symptoms like loss of appetite, lethargy, a fever, etc. 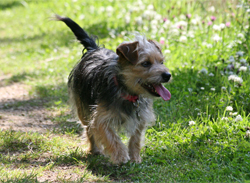 Following is a brief description of diseases that commonly affect a dog's lower urinary tract. They can all produce very similar clinical signs, so a trip to the veterinarian is necessary to reach an accurate diagnosis and plan appropriate treatment. A urinary tract infection (UTI) of the bladder and/or urethra is most commonly diagnosed in female dogs and is fairly rare in neutered males. A urinalysis and urine culture is usually necessary to diagnose an infection and to determine which antibiotic should be used to treat it. Make sure your dog finishes her entire course of antibiotics because the symptoms of a UTI often resolve before the infection is completely gone. If urinary tract infections become a recurrent problem, your veterinarian will need to look for an underlying cause. An abdominal x-ray and/or ultrasound usually reveals the presence of stones in the bladder or urethra. Your veterinarian may be able identify crystals in the urine under a microscope, which will help determine what the stone is composed of. Some types of bladder stones can be dissolved with pet medications or special diets but others need to be surgically removed. Once the stones are gone, your veterinarian may be able to recommend special diets or other treatments to prevent their return. Cancer within the lower urinary tract can usually be diagnosed with x-rays and/or ultrasound. Bladder cancer is treated with surgery, radiation therapy, chemotherapy, or some combination of the three. In some cases, the bladder, urethra and/or ureters may not have developed normally, and this can cause the symptoms associated with lower urinary tract disease. X-rays take after the administration of a contrast agent and/or ultrasounds should pick up the abnormality and surgery is usually required to correct it. Kidney or renal failure can be divided into two big categories. 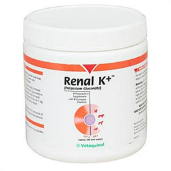 Acute kidney failure develops rapidly as a result of infection, toxin ingestion (e.g., antifreeze), etc., and dogs can recover with fluid therapy, dialysis, and other treatments if the damage to their kidneys is not too severe. Chronic kidney failure is caused by the more gradual loss of kidney function and cannot be reversed. The most common symptoms of kidney disease and failure are increased thirst and urination. However it can often be managed for a period of time with fluid therapy, prescription diets and and kidney health supplements and medications. A kidney transplant may also be an option in some cases.